House Speaker Nancy Pelosi, D-Calif., holds a press conference with former Rep. Gabrielle Giffords, left, and Rep. Mike Thompson, D-Calif., to introduce legislation on expanding background checks for gun sales at the Capitol in Washington, D.C., Tuesday. "You look at those years, 2009, 2010, when you had Barack Obama in the White House, 60 Democratic votes in the Senate, a big Democratic majority in the House, and not only did nothing happen, but it wasn't even on the table," said Peter Ambler, executive director of Giffords, the gun violence prevention advocacy organization founded by former Rep. Gabrielle Giffords, D-Ariz. "We had collectively, politically as a country said, 'We're not going to address this. The opposition is just too powerful.' "
Tuesday, on the eighth anniversary of the 2011 Tucson shooting that gravely injured Giffords and left six people dead, a bipartisan group of lawmakers introduced gun legislation to extend existing background check requirements to almost all gun sales and most gun transfers, including Internet sales, at gun shows and person-to-person transactions, with certain exemptions for immediate family. The bill is co-sponsored by Reps. Mike Thompson, D-Calif., and Peter King, R-N.Y., and includes four additional original GOP co-sponsors: Reps. Brian Fitzpatrick of Pennsylvania, Fred Upton of Michigan, Chris Smith of New Jersey and Brian Mast of Florida. "From the public polling to the ballot box, the American people have spoken up and demanded action to help end the tragedy of gun violence that far too many in our country face every day. We will continue our fight and we will deliver," said Thompson. "When background checks are used, they keep guns out of the hands of people we all agree shouldn't have guns," said King. It would be the first major gun legislation to get a vote in the House since the 1994 crime bill that temporarily banned the manufacture and sale of certain semi-automatic firearms. The Senate has tried, and failed, in the years since to pass legislation affecting gun sales, background checks and gun safety, but the House continually sidestepped the issue because of Democratic inaction or Republican opposition. In the nine years since Democrats last controlled the House, the mood on guns has changed on Capitol Hill. 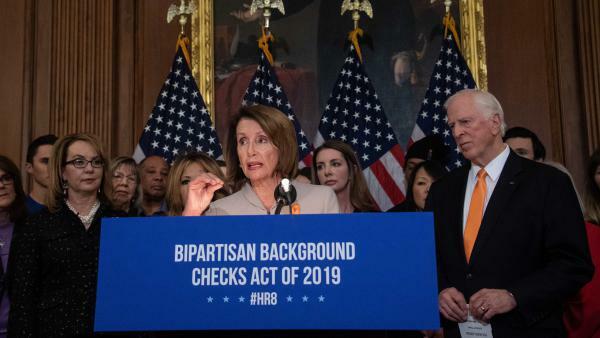 A combination of mass shooting events since then, plus elections that continue to edge out rural, conservative Democrats from the party, has resulted in a new House Democratic majority. It is once again led by Speaker Nancy Pelosi, D-Calif., who is eager to take up gun legislation this year. There is also a large freshman class of Democrats who ran campaigns loudly advocating for tougher gun laws, including Rep. Jason Crow, D-Colo., who defeated incumbent GOP Rep. Mike Coffman in a Denver suburban district near the site of the 1999 Columbine school shooting and the 2012 Aurora movie theater shooting. After a press conference with Pelosi and other House Democratic supporters, Giffords accompanied Thompson to the House floor to officially introduce the legislation. Democratic aides tell NPR top leaders intend to move the bill to the floor quickly. The National Rifle Association, a powerful gun rights advocacy group, opposes the Thompson-King legislation. The NRA counters that universal background checks would not have prevented any of the mass shooting events in recent years where all of the firearms used were purchased legally or because the background check system itself failed. 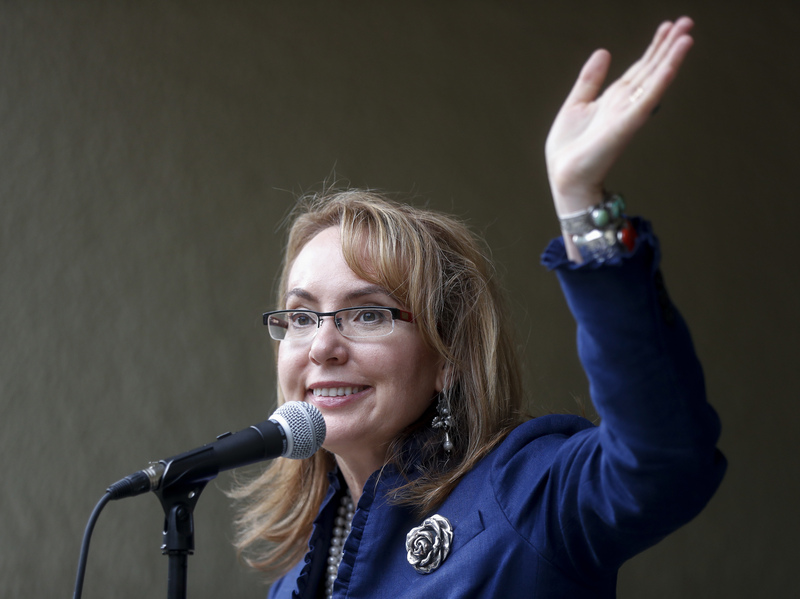 Former U.S. Rep. Gabby Giffords, D-Ariz.
Today is the eighth anniversary of the 2011 Tucson shooting that gravely injured former Democratic Congresswoman Gabby Giffords. She's in Washington lobbying with other gun control advocates for a new bipartisan background check bill. GABRIELLE GIFFORDS: Now is the time to come together, be responsible Democrats, Republicans, everyone. We must never stop fighting. Fight. Fight. Fight. SHAPIRO: NPR congressional correspondent Susan Davis is following the gun debate and joins us now. Hi, Sue. SHAPIRO: This is just the second week of the new House Democratic majority. And after the government shutdown, gun legislation is already right near the top of the agenda. What does this say about the changing attitudes of Democrats on the gun issue? DAVIS: I think it says Democrats aren't really afraid of the issue anymore. You know, a lot has changed since Democrats last controlled the House, including the Senate, under President Obama. They had control of everything about a decade ago, and they chose to do nothing on the issue of guns. Some things have changed. I mean, first, the sheer number of these mass shooting events that have occurred since the 2011 Tucson shooting has changed the national conversation. There's also just a political reality that there aren't that many Democrats left in Congress who don't support new restrictions on guns. The midterms - the 2018 midterms saw a lot of Democrats actually running on this issue, saying elect me to vote for gun control. And this new freshmen class of lawmakers see their majority as a mandate to vote for things like universal background checks. SHAPIRO: Tell us about this new bill that was introduced today. It calls for universal background checks. How would it work? DAVIS: So it would essentially extend current law for gun purchases - when you go to a store and buy a gun, you have to have a background check - to all gun sales and most gun transfers. This includes things like Internet sales, purchases at gun shows and person-to-person sales. There would also be some exemptions. It would not include, for instance, if you have an immediate family member who wants to gift a firearm to another member of the family. That kind of exchange would still be exempt. SHAPIRO: The Senate has repeatedly considered passing tougher background checks and repeatedly failed to pass those bills. Do you think this changes the calculation on what could actually become law? DAVIS: It doesn't seem likely that it's going to become law, but there's still some interesting movement about this bill. One of the authors of the Senate background check bill that has failed in the past, Pat Toomey - he's a Republican from Pennsylvania - called the new Democratic majority in the House a silver lining on the issue of gun legislation here. The House bill is also bipartisan. There's five Republican lawmakers already behind it, people like Peter King of New York and Brian Mast of Florida. He's an Afghan war veteran - Afghanistan War veteran who lost both of his legs in combat. And the House itself is going to be pretty notable. If they vote on this, it will be the first major gun bill to get a vote since the 1994 crime bill, which included the so-called assault weapons ban. We just haven't had to see lawmakers go on the record for their - where they are on the issue. I talked to one activist to say - who said they're clear-eyed about the prospects, but they want to see where members are, so they, in her words, will show us who's with us and who's against us going into 2020. SHAPIRO: That's NPR congressional correspondent Susan Davis. Thank you.